Don"t be like the Hampster on this wheel, going round and round. Listen, Be in the present moment. Be quiet in the Present Moment. That is all you have now. The past is gone, the future uncertain. You will hear your own breath. This way enlightenment is possible. Because right now, feeling your breath, with nothing in your mind. You will not hear anything going on between your ears. You are free from any craving, that leads you on in Sansara. Don't go round and round like the hampster. 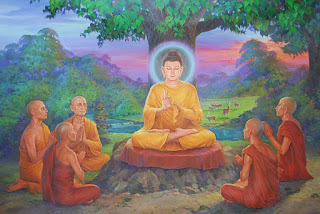 Now learn what the Buddha said, on the Full Moon Poya day, in July, about 2500 years ago. This fool moon day is called "Asala". A is pronounced like the first A in Amazon. Listen to it as it was chanted in Ceylon (Sri Lanka) in the 6th Century. Click on the words My favourite to listen to a three year old chant the Chamma cakka Sutta by Heart. Listen to it as it is chanted now at Amaravati Buddhist Monastery-UK.